Veteran socialist Sean Garland, 76, faces extradition to the United States on the basis of untested allegations compiled by the US intelligence services during the government of George W. Bush. They claim Garland conspired with the North Korean government in the late 1990s to undermine the US economy by distributing forged near-perfect $100 bills, so-called ‘Big head super dollars’. This is despite a renowned currency expert Klaus Bender stating that the Asian country could not produce such notes. Bender’s research shows the ink used, in the sample notes provided by the US intelligence services, and the paper they are printed on, with microfibres marked ‘USA 100’, is only available to the American government. At no time is Garland supposed to have handled these ‘super dollars’, the case against him is based entirely on alleged contacts with a UK criminal gang. A member of this gang Terence Silcock, 62, publicly claimed the US secret service have attempted to pressurise him into implicating Garland in circulating forged notes. Garland’s supporters, among them many elected representatives, believe that the case against the Dubliner emerged from a black propaganda campaign by the Bush administration. Garland has devoted his life to political activity. On New Year’s Day 1957, aged 22, he led a legendary, but ill-fated, IRA operation in which his young comrades Sean South and Fergal O’Hanlon died. 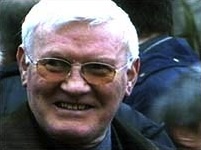 Since 1962, Garland, along with the late Tomas Mac Giolla and Cathal Goulding, sought to transform the republican movement into a socialist political force that would unite Protestants and Catholics. During the Northern Irish troubles, Garland was an outspoken critic of terrorism, from whichever quarter it came from. As a leader of the Workers’ Party, he has been a relentless critic of US foreign policy. On May 19 2005, a US grand jury court, based purely on information provided by the US intelligence services, issued a secret arrest warrant for Garland. This process was overseen by Kenneth L. Wainstein, then a US Government Attorney, later George W. Bush’s Homeland Security Adviser. With the governments of Tony Blair and Bush having agreed in 2003 a near-automatic right to extradition between their two states, the US intelligence services waited until Garland was visiting Belfast on October 7 2005 to activate their arrest warrant. Allowed return to the republic for medical tests, Garland was diagnosed with bowel cancer. He remained at his Navan home for treatment, forfeiting #27,000 bail. In the last days of the Bush government, the then US Secretary of State Condoleezza Rice issued a new warrant. On January 30 2009, Gardai arrested Garland. He is currently on #300,000 bail, raised by supporters, and must carry a mobile phone with him at all times so he can be tracked. Garland’s supporters believe that the source of the charges against him make a fair trial in the US impossible. They are calling on US President Barack Obama to recognise Garland’s contribution to peace and Irish society and withdraw the threat of extradition. Among the many prominent people and organisations supporting the call for the threat of extradition to be removed from Sean Garland are: Mick Finnegan (President of the The Workers’ Party), Rev. Chris Hudson MBE (Chairman of the Stop the Extradition of Sean Garland Campaign), The Executive Council of the Irish Congress of Trade Unions, Dublin City Council, The Parliamentary Labour Party, Sinn Fein Parliamentary Group - Northern Ireland Assembly, Dublin City Council, South Dublin Co. Council, Cork City Council, Kerry County Council,Gerry Adams MP (President of Sinn Fein), Dawn Purvis MLA (Leader of the Progressive Unionist Party), Bairbre de Brun MEP (Sinn Fein), Joe Higgins MEP (Socialist Party), Alan Kelly MEP (Labour), Sean Kelly MEP (Fine Gael) and former GAA President, Jack O’Connor (General President, SIPTU), Jimmy Kelly (Irish Secretary, UNITE), May Mac Giolla (the wife of the late Tomas Mac Giolla), Pete Seeger (Folk Singer and US political activist), Tommy Sands (Folk singer), Bobbie Hanvey (Broadcaster), Dr. Kieran Allen (UCD sociologist). Numerous other trade unionists, social and political activists.